Tell me about the liver agent Eovist®. How does it work and when do you use it? Eovist® (sold as Primovist® outside the USA) is a relatively new gadolinium-based MR contrast agent manufactured by Bayer HealthCare designed for liver imaging. The chemical structure of the molecule closely resembles Gd-DTPA, but with one arm of the ligand attached to the highly lipophylic ethoxybenzyl (EOB) group accounting for liver uptake. The abbreviated generic chemical name for the agent is gadoxetic acid. Gd-DTPA-EOB (Eovist®). The right side of the molecule is similar to Gd-DTPA (Magnevist®) with the additional phenolic side chain (upper left) which allows uptake by hepatocytes. After intravenous injection the drug initially distributes into the vascular and extracellular spaces in a manner similar to other gadolinium agents. Shortly thereafter up to half of the administered dose progressively accumulates in hepatocytes and then is excreted into the biliary tract. The remainder is excreted by the kidneys through glomerular filtration. Eovist® thus has double distribution and elimination pathways, allowing it to be used to assess both vascularity and function of liver lesions. The approved dose of Eovist® is 0.025 mmol/kg body weight, typically injected at a rate of 1-2 mL/min followed by a saline bolus. Breath-hold imaging is performed with a rapid 3D T1-weighted gradient echo sequence such as LAVA, VIBE, or CAIPIRINA using parallel imaging acceleration. At least three sets of dynamic breath-hold images are usually acquired: 1) a late arterial phase at approximately 15 seconds after contrast arrives in the abdominal aorta; 2) a portal venous phase 15-30 seconds later; and 3) a late dynamic phase 2-3 minutes thereafter. Finally, a fourth set of images in the hepatobiliary phase is acquired 15-20 minutes after injection (in patients with normal hepatic function). Hepatic enhancement generally persists for at least 2 hours following injection allowing a relatively large window for imaging. Eovist®. Late arterial phase shows hypervascular metastasis in right lobe of liver. Note enhancement of aorta and spleen. Eovist®. 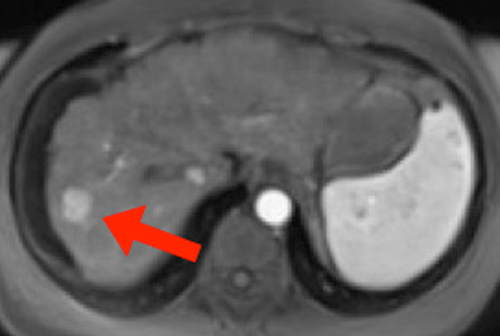 Hepatocyte phase shows no uptake in this metastatic lesion (arrow). An adverse reaction to Eovist® apparently unique to this agent is "transient dyspnea", occurring in about 10% of patients. This is dose-related and more frequent in patients with chronic obstructive pulmonary disease (COPD). It is manifest by significantly increased motion artifacts during the T1-weighted arterial phase of imaging. In the liver Eovist® competes with bilirubin for active transport into hepatocytes utilizing the organic anion transporting polypeptide 1 (OATP1) system. If bilirubin levels are elevated, hepatic parenchymal enhancement will be decreased and delayed. Excretion into the biliary tract is accomplished via the canalicular multispecific organic anion transport (cMOAT) system. Eovist® will therefore compete with other drugs that share this mechanism (e.g., cisplatin, tamoxifen, methotrexate). See the manufacturer's package insert/prescribing information for more details. Eovist® interferes with complexation methods for serum iron determination and may result in spurious values for 24 hours after injection. To my knowledge no cases of nephrogenic systemic fibrosis have been reported with this agent, but it is relatively new to the market. In theory it does offer some protection against gadolinium accumulation in that it is eliminated by hepatobiliary route in patients with renal failure or insufficiency. About 30% of the injected dose can be removed by a single 3-hour dialysis session. A dose-related prolongation in the QTc interval has been observed in animals and so there is a potential for arrhythmias in humans, especially those on drugs that prolong this interval (quinidine, procainamide, haloperidol, etc). Bayer Healthcare. Eovist® Prescribing Information. (Accurate as of 11/11/17 but check manufacturer's web site for updates). Cruite I, Schroeder M, Merkle EM, et al. Gadoxetate disodium-enhanced MRI of the liver: Part 2, Protocol optimization and lesion appearance in the cirrhotic liver. AJR Am J Roentgenol 2010; 195:29-41. Davenport MS, Bashir MR, Pietryga JA, et al. Dose-toxicity relationship of gadoxetate disodium and transient severe respiratory motion artifact. AJR Am J Roentgenol 2014; 203:796-802. Kim YK, Kim CS, Han YM, et al. 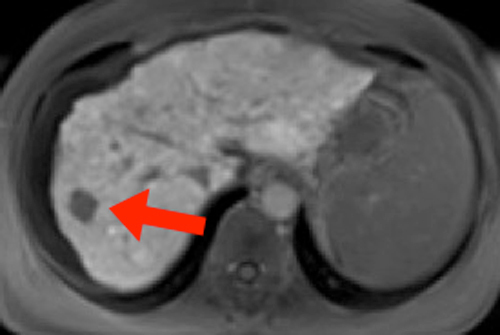 Detection of hepatocellular carcinoma: gadoxetic acid enhanced 3-dimensional magnetic resonance imaging versus multi-detector row computed tomography. J Comput Assist Tomogr 2009; 33:844-850. Lee NK, Kim S, Lee JW, Lee SH, et al. Biliary MR Imaging with Gd-EOB-DTPA and its clinical applications. Radiographics 2009; 29:1707–1724. Ringe KI, Husarik DB, Sirlin CB, et al. Gadoxetate disodium-enhanced MRI of the liver: Part 1, Protocol optimization and lesion appearance in the noncirrhotic liver. AJR Am J Roentgenol 2010; 195:13-28. Van Beer BE, Pastor CM, Hussain HK. Primovist, Eovist: what to expect? J Hepatol 2012; 57:421-429.